Ischemic stroke is one of the leading causes of death and disability worldwide. Although the benefits of antiplatelet and anticoagulation therapies in secondary prevention of ischemic stroke are well established, administration of “mild” platelet inhibitors such as acetylsalicylic acid (ASA) together with pharmacological thrombolysis (t-PA treatment) to improve microvascular patency in the acute phase lead to unacceptable bleeding complications. The distinct molecular mechanisms how platelets contribute to thrombo-inflammatory processes in the ischemic brain remain, to a large extent, unknown. We could demonstrate that platelet secretion is an important mediator of thrombo-inflammation in the ischemic brain. However, besides platelets, endothelial cells (the major component of the blood brain barrier) and leukocytes (in particular T cells) play a central role in ischemia/reperfusion (I/R) injury. Accordingly, lack of T cells results in dramatically reduced infarct sizes and abrogates thrombus formation. Moreover, targeting the early steps of platelet adherence to the vessel wall via glycoprotein (GP)Ib/von Willebrand factor (VWF) interactions not only reduced thrombus burden in the cerebral microvasculature, but also limited the local inflammatory response in the ischemic brain. To develop novel treatment strategies in acute stroke, it is necessary to understand the detrimental interplay between thrombotic and inflammatory circuits, which would only be possible if the cellular interactions can be visualized. Since only optical microscopy techniques offer sufficient resolution, we have established optical clearing and labelling protocols for light-sheet-fluorescence microscopy (LSFM). In parallel, we have optimized our custom-built LSF microscopes and developed an image processing and analyses pipeline. 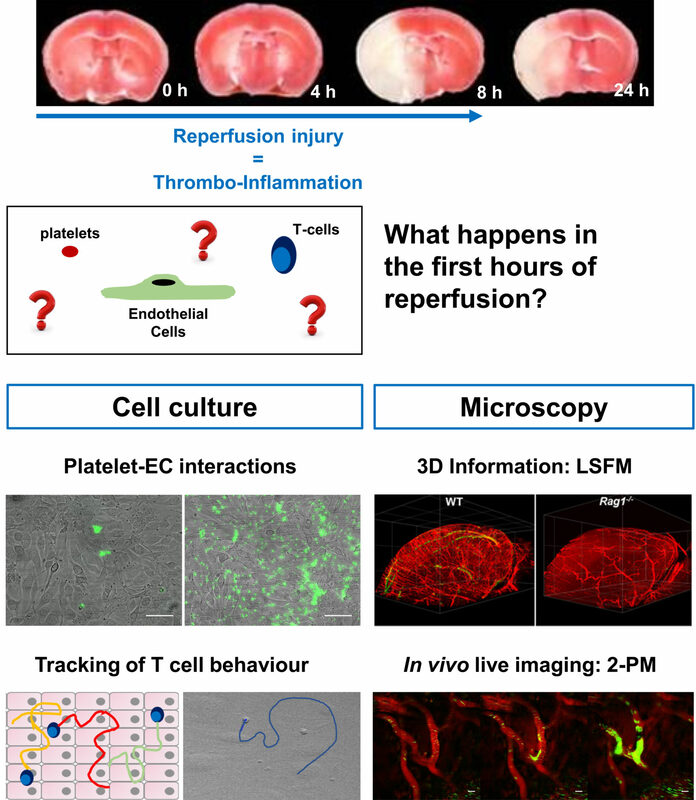 This approach enabled us to map cellular interactions in the ischemic brain and revealed that the decisive events occur within the first 6 h following reperfusion, while secondary thrombus formation in the brain vasculature was observed at later time points (unpublished). In this project, we will focus on the role of platelets in the early phase after reperfusion. We will apply transcranial two-photon intravital microscopy (2P-IVM) to visualize the dynamic interactions within the ischemic brain. In order to achieve higher penetration depths and a bigger field of view, we will pursue different technical approaches to optimize our 2P-IVM. We will make use of transgenic mouse models and pharmacological tools to block key molecules for the thrombo-inflammatory cascade and study the consequences in vivo with our 2P-IVM approach. In addition, ex vivo/in vitro cell-based assays will be used to elucidate molecular interactions at the blood brain barrier and its consequences for barrier function in a controlled setting. Our complementary approaches will provide a better understanding of the pathomechanisms, taking place in the vascular compartment, underlying infarct progression in the ischemic brain.